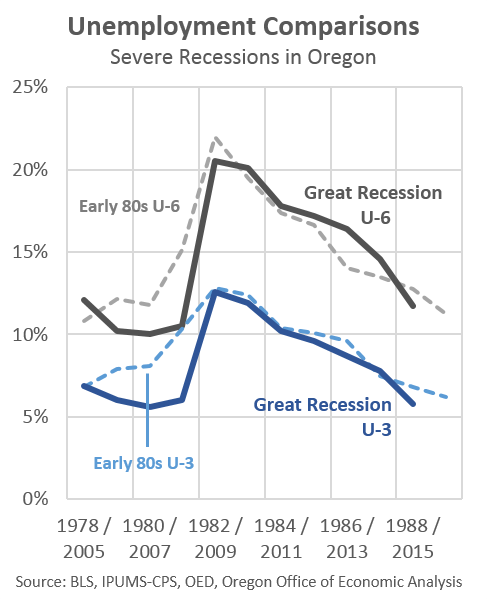 Unlike the nation, unfortunately, Oregon’s Great Recession does have a modern peer: the early 1980s. Our office has documented the similarities numerous times over the years, from the unemployment rate to total jobs and from housing starts to manufacturing jobs and the like. Below are a few updates to the comparison and add in our new measure of the Total Employment Gap. 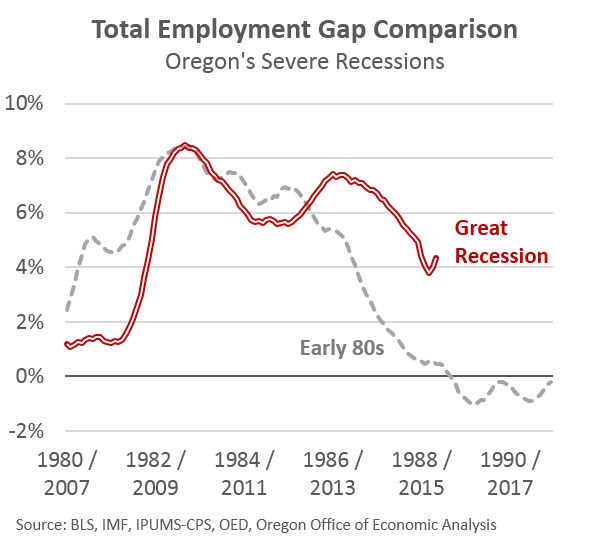 First, total employment in Oregon returned to pre-recession levels following the Great Recession 3 months ahead of the early 80s recovery, or nearly 7 years after job losses started (83 months overall today vs 86 months back in the 80s.) Similarly the unemployment rate and even the U-6 measure of labor market utilization followed very similar paths to the 1980s. In early 2015 both measures were actually a bit below their comparative figures nearly 30 years ago. However, while the topline economic data are nearly identical, it does not mean everything is the same of course. In particular two, related, differences arise: population growth and labor force participation. In both cases, population growth slowed considerably from pre-recession rates. However one very big difference emerges in the fact that Oregon lost population in both 1982 and 1983. This is the only time Oregon has lost population in the state’s modern history. Former state economist Tom Potiowsky has a great story of moving to Oregon in 1983. Following graduate school in Colorado, he accepted a job offer from Portland State. U-Haul did not charge him anything for his trailer. The outbound traffic from Oregon was so large and in such demand, the company let him bring a trailer into the state for free, since they could turn around and rent it to someone else moving out. In essence, Tom was doing the company a favor. That did not happen this time. Overall population growth has been much stronger today than back in the 1980s, both in growth rate terms and in total number of new Oregonians. From 1980 to 1987, Oregon added 59,800 individuals for an increase of 2.3% overall. From 2007 to 2014, Oregon has added 221,400 individuals for an increase of 5.9%. That’s nearly 3.7 times as many individuals for 2.6 times the growth rate. One place such differences show up in the economic data is in the total employment gap which combines the unemployment gap, the labor force participation gap and the underemployment gap. 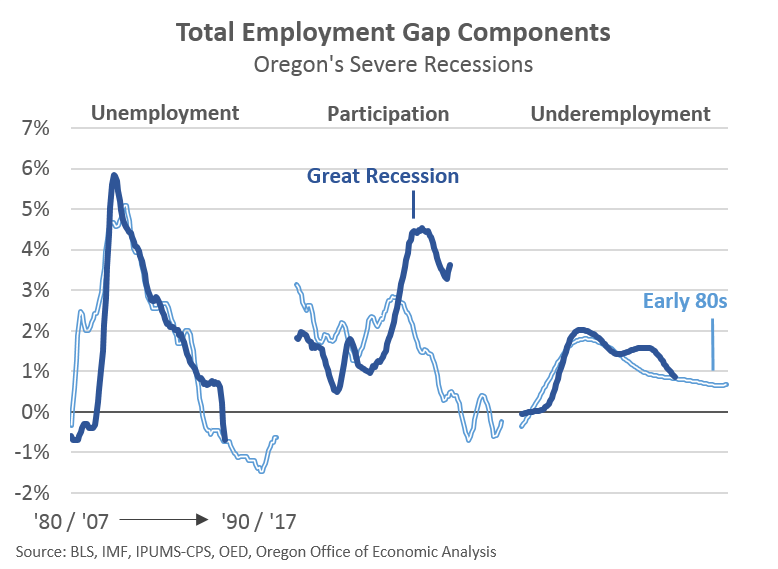 Today, Oregon’s total employment gap is 3.5-4 percentage points higher than back in the late 1980s, even as most topline economic measures are the same. The reason for the difference is the labor force participation gap, as both the unemployment and underemployment gaps are identical to the 1980s. It’s hard to pinpoint the exact nature of the differences however a few possibilities exist. One, the fact that the state did not lose population has to play some factor given that at least some of the early 1980s population loss was due to workers leaving in search of job opportunities elsewhere. Two, the Baby Boomers are at vastly different points in their working careers today (retiring, or nearing retirement) compared with the early 80s (just finishing college or still in their 30s.) This impact on the overall labor force participation rate over time is immense. Third, the labor market simply is not as strong today as back in the mid- or late-80s. I think all 3 possibilities play important roles here and certainly are not mutually exclusive. The nature of the business cycle this time is completely different than back in the 1980s. Not only did the Fed cut interest rates back then to revive the economy (after choking off inflation with a Fed funds rate of about 12%, mortgage rates at 18%), but the generational impact of the Boomers entering into their prime working years in the late 80s and early 90s was a considerable boon to the economy. Today we’re dealing with the exact opposite situation. The Fed was cutting interest rates heading into the crisis and has held them low since and the Boomers are exiting their prime working years. On the somewhat bright side, the early 1980s has helped our office in our forecasting of the recovery. Since about mid-2009, Oregon jobs, income and tax revenue has largely tracked our expectations, even if the severity of the crisis caught us off-guard. Regardless of the exact differences and unlike the nation, Oregon has seen such an economy before. Jobs and unemployment are identical today and nearly 30 years ago. However even after accounting for demographic differences, a labor force participation gap remains today. Our office expects a stronger economy, with larger wage gains to draw more workers back into the labor market over the coming year or two. All told, we expect the total employment gap to close, or for Oregon to reach full employment, in about 2 more years. Oregon is growing strongly today, however the damage from the Great Recession is still not fully healed. A very clear post on an issue that has been difficult for analysts to explain clearly to policymakers everywhere (see current debate on when the FMOC should raise interest rates. A whole new take on ” this time it is different”).